The Lakeside Spitz has 5 conference rooms, altogether 650qm, for 420 people in the largest room. The venue is located just a few 100 meters away from Lake Wörtheresee. The Seepark Hotel Congress & Spa as a conference venue has 5 meeting rooms on altogether 350m ², for 200 people in the largest room. 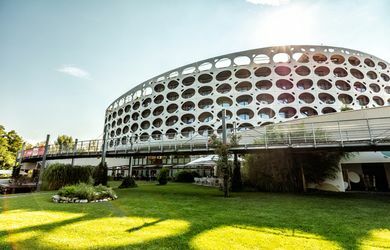 The conference hotel has 142 rooms and is located in Klagenfurt at the lake Wörthersee.